Hello everyone, sorry it has been awhile between newsletters. I have a bit of a sad tale to tell. On the 23rd of August I suffered a heart attack. Not a good thing when you are 42, it seems I had some family history of heart trouble that I didn't know about (thanks Grandpa) and that the pills I was taking (Vioxx) to relive the swelling and pain when I broke my back 4 years ago did the trick. No doubt along with the stress of running my own business and my involvement as a District Commissioner with the Scouts. It was a shock to wake up the next morning in a ward full of people who were either old, smokers, overweight or all three in some cases. I have never smoked, are not overweight, are fit (did the Overland track in Tasmania with my son James two months ago) and don't drink that much. You never know what life has in store for you. There are two positives in all this. 2) I have been told that the odds are now good. If you survive the first one then on average your don't eventually die of heart trouble as you know to look after yourself. The damaged artery is not able to be operated on, but I have been given a course of pills and a exercise programme that they say will bring me back to where I was before. I would also like to mention that one of the things that does make these newsletters all worthwhile is the great comments that are e-mailed to me after each issue is published. I know I don't respond to all of these but I do truly appreciate the compliments. Alloy wheels page. We have a new range of alloy wheels for sale at substantially cheaper prices than the old range. As we are selling more we are able to buy at a better price and pass that saving on to our customers. As we can now have up to five pictures per page on the new version of the site we will now be posting pictures of various cars with the wheels fitted over the next few months. Picture gallery. We can now have a picture gallery to post as many shots as we like, the old system had only 10 shots. We will use this to post shots of various MB club events and other significant things. I am working on a new page for our 412D campervan and a page with a picture of all the cars I have owned over the years. As always we are concerned about subscribers information security. We care very much for your privacy and have some of the strictest anti-spam protection around. For this reason you cannot change your e-mail address or name by logging on and trying to edit it. You can however change your password. If you have changed your e-mail address please start your subscription from anew. We are working on a new cutting edge system that will work around this problem, so you can change your e-mail address and still offer you the high level of security that we have currently built into our system, but in the meantime please re-register and then contact MBSpares to have your old account de-activated. Several newsletters ago we had some lowering kits for W124's. Well we have found another 5 sets! 2x 4cyl version and 3x 6cyl version. These will lower the car 20-30mm depending on what size rubber spacers are used. Normal retail is $750.00. These are defiantly the last ones and are on sale at $395.00 a set. A friend of mine sent me this picture of a Gullwing arriving home at his father in-laws house for the first time in the mid 50's. It has an interesting story that goes a bit like this. 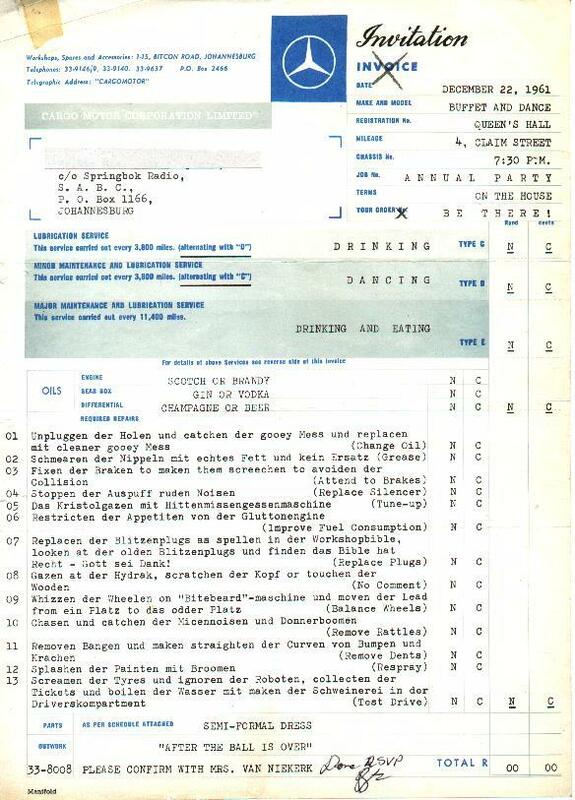 Laurie ordered a brand new Gullwing and was in Germany when it was being built. He was taken on the production line to see it being built and commented he wants to make it right hand drive. They wouldn't sell him the car so he was not happy. From Germany he heard of Gullwing for sale in New York being sold by the Boss of General Motors. He flew to New York and bought the car and drove it across America. The car had a factory performance camshaft, Rudge wheels and later he discovered a Limited slip diff.. He had it shipped to Australia and delivered to his home in Strathfield (photo) . There has been a article going around that explains he gave it Col Rizzo when he went overseas and told him to see if he can work out how to make it right hand drive which wasn't that easy with the tubular chassis etc. In the end he worked out a plan and Laurie got him to go ahead and do the job.. It was during testing that the vehicle was found to have a limited slip diff which was a very rare thing. Believe it or not Laurie changed the colour to white after one year (probably too hot in the Aussie sun) and sold it a year or so later - he has never heard of the car since - is it still in Australia? Whoever owns it now would know it was Laurie O'Neil's car . Laurie has owned I would say well over 100 Mercedes Benz's and driven them all over the world. He still says that the most stable and impressive Mercedes he has driven at high speed was his 190E 2.3 Cosworth that he bought new in 1986. When new he followed the Paris Dakar race from Paris and travelled at 150mph for long distances at great ease. There are plenty of great stories out there on the cars that we love, if you know of one please send it in to me. I am working on getting a copy of the story about how it was converted. Don't forget we have for sale a limited amount of Mercedes-Benz dealership overalls and dust coats. We have also found a decent quantity of USED overalls that we will be selling for $40.00 each. The NEW overalls are $75.00 a pair and the dust coats are $50.00 each. Give us a ring if you don't understand the sizing system. Ph 1300 787 300 ask for Colin, he is the overall guru (he is the one on the left). 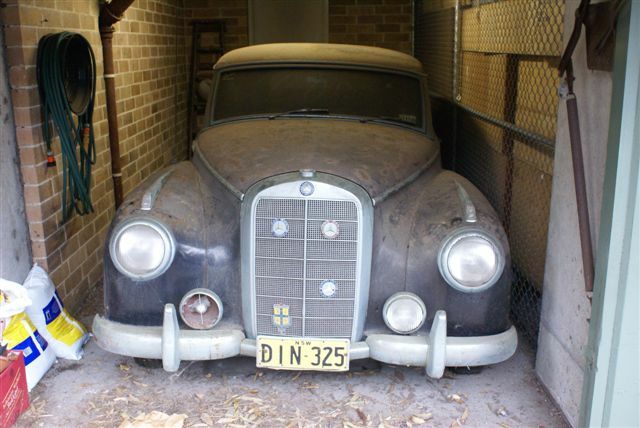 Four months back we reported on a 1953 Type 300 that we had recovered from under a block of flats in Sydney where it had sat for over 32 years. Well we have another one, this time in much better condition and it is a later model 1959 300d. This is the pillar less version with the fuel injected engine and automatic transmission. Avid newsletter readers will remember a beautiful black one that we sold about 2 years back. We will be doing a few clean up jobs on this one and then selling it possibly on an ebay auction. If you are interested please let me know. Do you do your own oil changes at home? Here is the list of what is done in our workshop for a basic lube service. OK, it's been awhile and some of you may not have even remembered what the picture was so click here for a reminder. The question was What model and variant is this engine from. Now I must say that nobody got it first up, a few of you correctly worked out that it was a M120 V12 engine, but I was after more than that. It is a late M120 as fitted to a W140 600SEL. You can work it out from the lack of a distributor cap mount and no hole for the rotor button to poke through. Early versions had a distributor cap with rotor driven off the front of the camshafts, later versions had a coil pack for each cylinder. 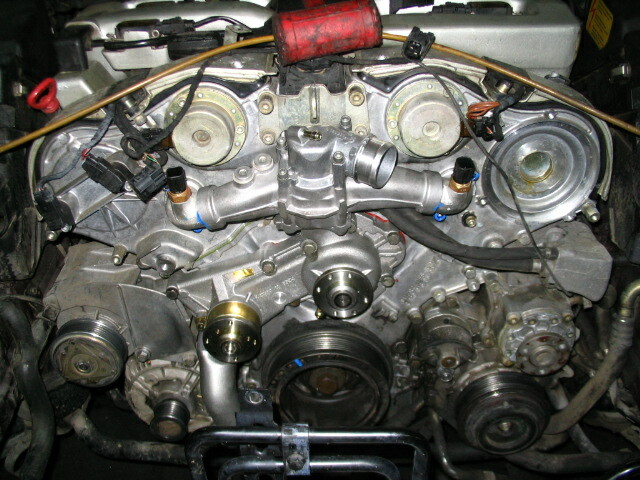 The engine variant is a 120 982. The red thing on the top is a rubber hammer..... :-) The most correct answer was Greg Yates who is a member of the NSW Mercedes-Benz club and avid poster on various MB forums around the world. 14th October 2007. The Mercedes-Benz club of the ACT 32nd Annual Concours d'Elegance to be held on the beautiful Rond Terraces overlooking Lake Burley Griffin. This event is sponsored by M.B Spares & Service and is a highlight of the Mercedes-Benz club calendar in Australia each year. Full details including the application forms can be found at their website click here and then click on the Concours link at the top of the page. The details and application forms are in a link on the r/h side of the page. The theme for the Concours is to celebrate the 100th anniversary of the first Mercedes-Benz Four Wheel Drive?? Those of you who read the Geocentric (the AGOA magazine) or any of the other various magazines will have checked out articles on the Dernburg wagon made by Daimler in 1907. They are trying to get as many 4x4 Mercedes-Benz there as they can. 18th - 22nd April 2008. As reported in the last Newsletter the next Biannual rally for the Mercedes-Benz clubs of Australia is being hosted by the Victorian club. Maybe you will have attended or seen our reports from the ACT Rally held in 2006 which was a great success. This rally also is shaping up to be an excellent time. Please have a look here for a general overview as supplied by the Victorian club. If you are interested in attending the rally application forms will be available from your local Mercedes-Benz club. A listing of there contact details can be found here. 16th March 2008. Shannons Wheels Expo is one of two major annual events hosted by the Council of ACT Motor Clubs. Each March since 1982, hundreds of vehicle enthusiasts have participated in this trip down memory lane which is an official part of the Canberra Festival supported by Australian Capital Tourism It is held on the lawns of Old Parliament House, Canberra and this year is being hosted by EJ-EH Holden Club ACT. This event has traditional been very well supported by the Mercedes-Benz club of the ACT with over 50 cars on display. The late model black W124 300D that we sold two months back went to one of the administrators of the OZBENZ forum that we sponsor. Now he is a very observant guy. While we were filling out the paperwork in my office he spotted this framed on my office wall. It is an invitation to Christmas party in Johannesburg in South Africa. Many years ago we purchased a 1961 190c with an interesting history and this invitation in the glove box. The car was one of the first of the Fintail bodied 4cyl car to be made in South Africa. The owner was a journalist who was sympathetic to the civil uprising at the time. He claimed to have carried some of the leading political figures of that time in the back seat including Nelson Mandela. Anyway he had to leave South Africa in 1962 and migrated to Australia. He kept the car for another 30 years and sold it to us when he had to stop driving. Anyway, he noticed it was from Cargo motors and when he got home looked them up to see if they were still around and found this. The name "Cargo" is a combination of the first letters of the first names of the founders of Daimler-Benz, CAR(L) Benz and GO(TTLIEP) Daimler. On occasion, it has also been said that means just CAR GO or that in our early years, we mostly sold trucks and were therefore in the "CARGO" business. Check them out here. Don't forget that if you find something interesting on the net to send me a link to it. - Are you into AMG's? Here is the link for the AMG club in Germany, unfortunately in German but the pictures are worth looking at. - Not sure if this one is exciting or scary??? - OK, so how many of you have seen the pictures of all the cars in a barn in Portugal. We even had them as a link in one of our previous newsletters. Click here for the true story. Finally I have decided to sell the W114 factory stretch that I have been working on for the last five years. It in a unfinished project, factory stretched W114 sedan. 2.8lt twin cam engine with 4 speed auto. Over $10000.00 spent on bodywork and full rubber seal kit. Black interior with perfect dash and timber work. many other new parts. Would make a great club car or wedding car. A200 2005 model "as new"